This was the third original Superman movie I remember watching, even though it was actually the fourth one. I think I was freaked out by it for a long time… possibly because Superman is in actual physical danger again. I find it really interesting that, despite being the Man of Steel and technically invincible, each of the movies has a different kind of danger… not just for the people of Earth, but also for Superman himself. There was a nice bit of foreshadowing in this movie. It wasn’t very good to see that the Daily Planet had been bought off… though I couldn’t help feeling some sympathy for Lacy, especially since it was obvious she was romantically interested in Clark. I found it a bit amusing to see Superman spending time with Lois while, at the same time, trying to also spend time with Lacy as Clark. I couldn’t help feeling sorry for him, having to switch places between them. For anyone else, I’m sure they would have been exhausted. It was cool to see Lex in this movie. I can’t help but think he makes a good adversary for Superman… even though he’s a bad guy, he comes across as a genius. I was less than thrilled with his nephew. Lenny wasn’t exactly very bright. It would have been good to see Nuclear Man evolve past his origins, since his single-minded purpose in destroying Superman meant that he wasn’t an interesting villain. It was good to see that he knew how best to manipulate Superman… like by attacking the people. The CGI isn’t really good in this movie, but the atmosphere of it is still really good. I love the music… it definitely puts me in mind of Superman. 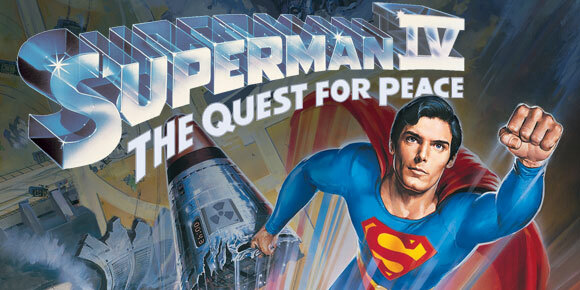 I personally think that Superman II was the best of this movies… but this one was still entertaining to watch, even if it does seem to disregard the events of Superman III. And it dealt with the issue of nuclear weapons… something I think is an important issue. It’s a bit disappointing to have reached the last of Christopher Reeve’s Superman. I do have Superman Returns to watch next, though.